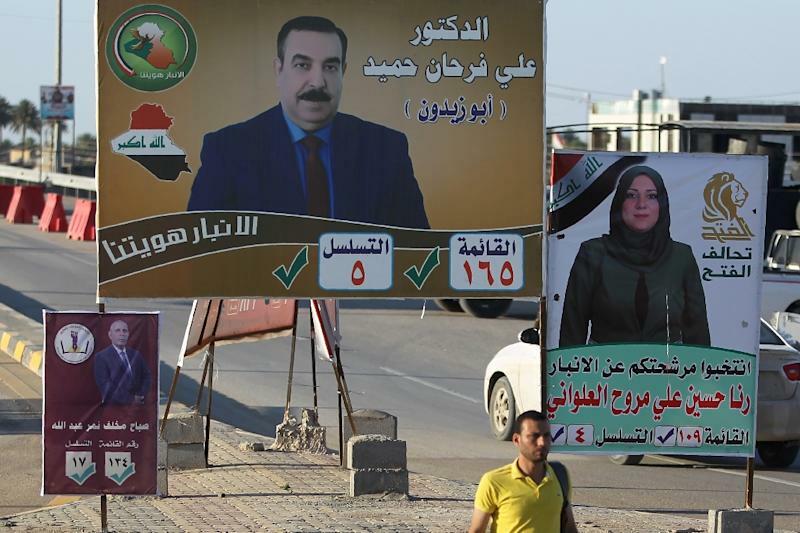 Ramadi (Iraq) (AFP) - In the vast desert province of Anbar where Islamic State group jihadists first emerged in Iraq, parliamentary elections next month are an opportunity for the predominantly Sunni residents to settle scores. Many of the new candidates are eager to push out lawmakers they believe minimised the danger of -- or even sympathised with -- the Sunni extremists that stormed across the country in the summer of 2014. "The political class that existed before IS is no longer suitable. They have lost their credibility with the residents of Anbar," said Rafea al-Fahdawi, who heads the candidate list in the province for the Victory Alliance led by Prime Minister Haider al-Abadi. "They were involved in bringing terrorism and made people believe that terrorists were just rebels belonging to our tribes. The people of Iraq will punish them at the ballot box," said Fahdawi, leader of the Tribes Against Terrorism coalition that battled jihadists in the western province. In the lush garden surrounding his home in the city of Ramadi, tents were set up to host crowds that came to listen to Abadi, part of the premier's campaign tour in the area. "We fought against terrorism, and today, thanks to our campaign, we want to continue the fight against sectarianism. We have great hope for change," said Fahdawi, 62, dressed in a traditional white robe. In January 2014, IS jihadists captured the city of Fallujah just west of the capital, and after a year of heavy fighting they took the city of Ramadi too. The people of Anbar are eager for change, their feelings fuelled by burning disappointment with the political class. A quarter of the contenders are running for office for the first time, according to the electoral commission, who say the province's electoral lists include women and young people. "The Iraqi people, in general, want to see radical and complete change. We will not accept the same faces under different (party) names and slogans," said Sheikh Mohammed al-Nimrawi, a leader of the Khalidiya tribes in Ramadi. It is a stark difference from previous polls and campaigns, which were bleak and almost secretive affairs as jihadists increased attacks on polling stations. 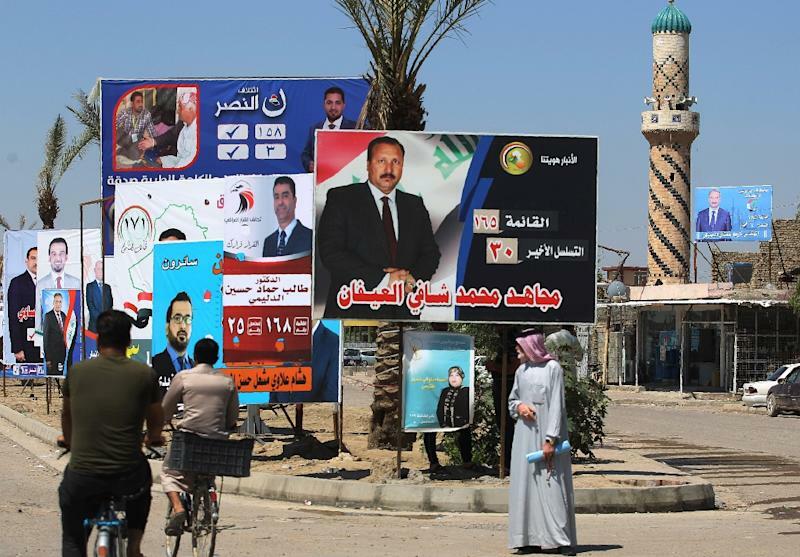 Despite IS threats against this year's elections, campaign posters are everywhere in Anbar -- hanging on the city's destroyed homes and on the walls of newly rented candidate offices. "The time for change has come. Anbar will witness social and political revolution and choose men who can steer the ship to safety," said Khalaf al-Jeblawi, a candidate on the Conquest Alliance list. "The province has emerged from a fierce war and the Hashed fighters played a big role in the battle," he said. The Hashed al-Shaabi paramilitary force was formed in 2014 at the urging of Shiite spiritual leader Ayatollah Ali Sistani to counter the IS blitz. But three years of brutal jihadist rule may have helped ease sectarian tensions between Iraq's Sunnis and Shiites. "While sectarian identities do retain a (somewhat diminished) political relevance, when it comes to violence, today 'sectarianism' is yesterday's conflict," said Fanar Haddad, a senior research fellow at the National University of Singapore's Middle East Institute. "I think that, for now, sectarian division is no longer the defining feature of Iraqi political mobilisation."